Knowing how to accurately prepare clean files is a critical skill for any designer. You may work in an environment where you only design, and the production department cleans up your files and passes them on. But knowing these requirements will keep your work “producible” and you in the good graces of your production team. Bleeds The number one faux pas of newbie files is no bleeds. This can cause so much trouble in prepress that it deserves to be the first item in software settings. When you set up your file, turn on bleeds so that you can see them. Then make sure that anything that runs off the edge of the page extends to the bleed line. You will soon learn that type and images become critical in their placement for bleeds, and you do not want to leave these decisions in the hands of your printer’s prepress department. Many printers will not make changes to files unless you specifically ask them to do so or mark your request on a proof. Process Colors (cyan, magenta, yellow, and black) All the process colors are transparent. That is why images printed with only the four process colors look wonderful because the colors optically mix. Process black is transparent. If you print process black over another element, the element will show through. If you place a solid area of process black next to a photo with dark areas, the photo’s dark areas will look darker, and the 100% black area will look too light or simply incorrect. Build and use rich black, not process black, for projects using photos or elements that have dark screen builds. Specifying process colors using a Pantone process specifier helps you preview colors side-by-side before they are printed. Your monitor, if calibrated, is useful for roughing a design, but using a specifier is far more accurate when you are building your final file. Not only can you see the printed colors, but they are also formulated to reproduce without too much ink being laid down. Rich Black Rich black is a mixture of the four process colors — Cyan, Magenta, Yellow, and Black. This formula for a neutral rich black works well for most printing methods: 60% Cyan 40% Magenta 40% Yellow 100% Black Some presses and papers have a limit on the total amount of ink possible, for example, 250%. The rich back recipe above totals 240% and is therefore fine. If you specify C100, M100, Y100 and K100, it won’t work. If you are printing digitally, rich black may result in a weaker black (check with your printer). Do not build rich black type. Specifying a Spot Varnish or UV Create a spot ink color in your file and name it varnish. Let your printer know that varnish needs to overprint the inks underneath it. If you have more than one varnish, name each one appropriately, such as “Gloss Varnish” and “Dull Varnish” or “UV” The actual color you choose to represent that color is irrelevant, but you want to make it stand out so it’s easier to identify in the file. Applying CMYK Color to Type If you must apply a process color mixture to type that is smaller than 18pt, for instance, make one of the colors 100% so the font has a solid outline that the other colors can float within. This will save you some heartache at press checks. Look at the example below which is greatly magnified to show you what is happening when you apply a screen build to type. The top example has magenta set to 100% whereas the bottom example has the magenta set to less than 100%. Note how the outline of the type is lost and becomes and series of jagged dots. That is what happens in your file. Choosing a Color Library Know the destination of your color space before you start designing. If you shift destination color spaces, i.e., you start a file for the web and need to re-purpose it for print, changing the web colors (RGB) to process colors (cmyk) might be better left to your printer. Converting spot colors to process colors can result in some unwanted shifts in color. Know where you are headed by using a Pantone Color Bridge set that will show you the RGB, process, and spot equivalents with their shifts. Specifying Pantone Solid Color Solid color is a color that is made up from one ink. 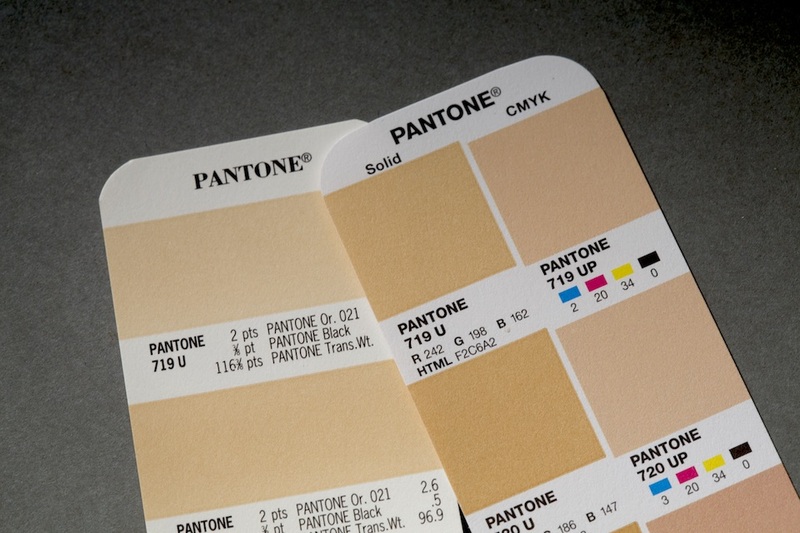 The Pantone system has books of nearly every color model imaginable, reproduced in fan decks so you can see how your color looks on paper. Ink will look different depending on whether the paper is coated or uncoated. So when you are selecting inks for your file, make sure you are looking at the correct swatch for your project. In your file, use the C for coated and the U for uncoated designations and on your estimate request. Although there are designers who will specify 485c on an uncoated sheet, there is no way to get 485c red to look like 485c on an uncoated sheet without using a clear foil to make it shiny. 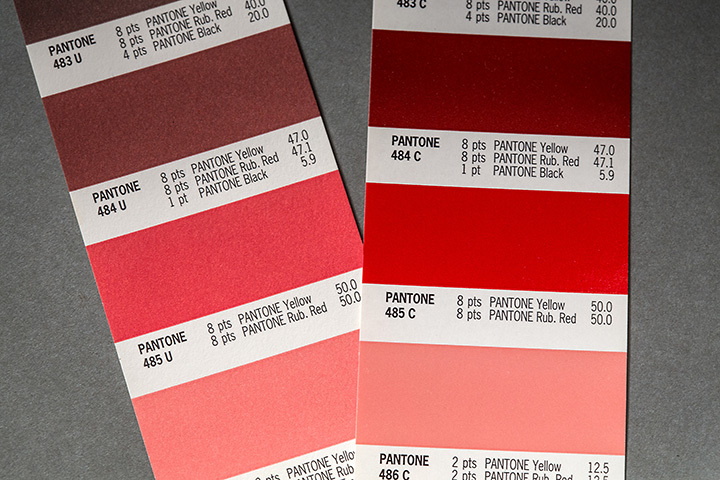 If you don’t like the way your ink looks on the Pantone uncoated swatch, you are not going to like it on your job. Find a color you can live with, and remember to look at the double hit colors, i.e. 485c 2× to see if that is what you want and if so, be willing to pay extra. Hairlines A hairline is not an actual measurement. It is the thinnest rule a device can produce. If you draw a hairline rule in a file and print it on your inkjet in your studio, it is going to be different from the “hairline” of a high-resolution laser printer, your printer’s plotter, and your printer’s plate setter. This kind of variability exists, even in this day and age. So, don’t use hairline rules. Specify an actual measurement instead. Fold Marks A fold mark is shown by a dashed line placed 1/16th of an inch outside the pasteboard and is at least 1/4 inch long. When folds are critical, you should place fold marks in your file. A solid line is a cutting line, so make sure to use a dashed line for a fold. Naming Colors Give the colors in your file the same name as the ink color you are printing. This might sound like a no-brainer, but you would be amazed at how many files come to a print shop that were quoted and ordered up for a certain color, say 485c, and then the file says “Rubine Red.” Your job is going to stand still until your printer finds out which color is correct, the color on your order or the color in the file. Clean Pasteboards You’re going to brainstorm in your file, experiment with different fonts, drop in graphics, produce illustrations, change rule weights, and ultimately use only a portion of what you’ve been playing with. It’s natural to drag those unused items to the perimeter of your pasteboard so they are out of sight. Working in preview mode, you might forget that those items even exist. The problem occurs when your vendor has the file and all those items are still sitting on the perimeter. These items might include photos that are no longer linked, spot colors applied to elements that are not being used, and fonts that are no longer in the final document. All those extra items increase the size of the file and the ripping time. If any of those items are missing from your finished document, your printer’s prepress department is going to look for them. Prepress operators and/or prepress software are going to scan your document, find problems, and then start trouble-shooting those problems. In reality, those extra items really aren’t “problems,” but the software doesn’t know how to distinguish that. The last thing you want is for your files to have a reputation of not being clean. After all, prepress operators will not pick the most difficult file in the pile to work on first. They will choose the easiest one, even if it may not be the one with the most urgent deadline. Keep your files clean, and your job will move to the top of the pile without you even having to ask. Final Page Size Often, the page size of your project will change as it moves from the initial idea to the final version. For example, if you started with a 5 in. × 7 in. postcard, it will be tempting to simply place crop marks on that 5 in. × 7 in. page to turn it into a 4 in. × 6 in. postcard and send it off to the printer. Shortcuts like this cause a nightmare on the prepress side. The printer must then resize your document and center all your page elements. With a multiple page file, the problems are compounded. You can only imagine what could go wrong. So, make sure that the file you submit is built the way it’s going to be printed. Proofing Type Before you send your file to the printer, get in the habit of thoroughly proofing the copy. Do not assume that the printer is going to read your document, however short. Run spell check, and then make sure someone, not the person who wrote it, proofs it. A fail-safe proofing method is to read the text aloud to someone who is following along with the marked-up hard copy. If you have a horror story about one of these dirty file problems or another software-related horror story, please comment and share. We all learn from each other!